McDonald's is recalling 2.5 million Happy Meal toys given away at its restaurants in the U.S. and Canada over a potential danger to young children, the U.S. Consumer Product Safety Commission said on Monday. 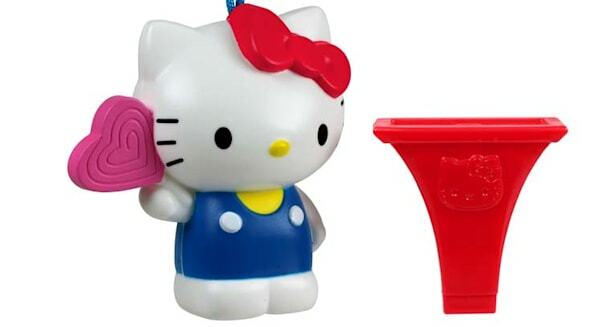 The Hello Kitty whistles were included as part of a giveaway with Happy Meals and Mighty Kids Meals last month and the beginning of this month. Anyone who has the whistles is asked to take them back to McDonald's. In exchange, McDonald's will provide another toy and your choice of a yogurt tube or a bag of sliced apples, the CPSC said. McDonald's announced the recall after hearing reports of two children who coughed out pieces of the whistle after putting the whistles in their mouths. One required medical attention. The whistles are red and came with a Hello Kitty figure that is holding a pink heart-shaped lollipop. The following text appears above and below Hello Kitty's face on the whistles: "©1976, 2014 SANRIO CO., LTD" and "Made for McDonald's China CCW Chine." The recall was unusually quick, occurring almost immediately after the product was put into the marketplace. In addition, McDonald's is offering an incentive for its return. While nominal, that does represent a more progressive approach to this sort of recall than is typical. "By reporting as fast as they did, CPSC and McDonald's were able to work together to get the word out to parents, grandparents and other caregivers to help prevent any other incidents or serious injuries," CPSC Chairman Elliot Kaye said in a statement sent to Daily Finance. "We urge all parents and other caregivers who believe they might have received one of these Hello Kitty whistles from McDonald's to act on this recall immediately."